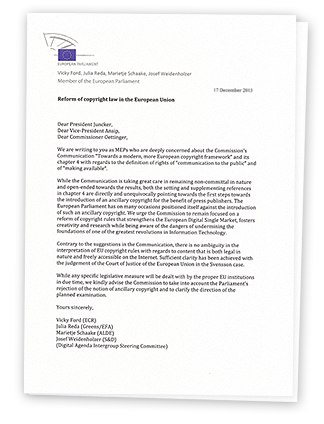 We are writing to you as MEPs who are deeply concerned about the Commission’s Communication “Towards a modern, more European copyright framework” and its chapter 4 with regards to the definition of rights of “communication to the public” and of “making available”. While the Communication is taking great care in remaining non-committal in nature and open-ended towards the results, both the setting and supplementing references in chapter 4 are directly and unequivocally pointing towards the first steps towards the introduction of an ancillary copyright for the benefit of press publishers. 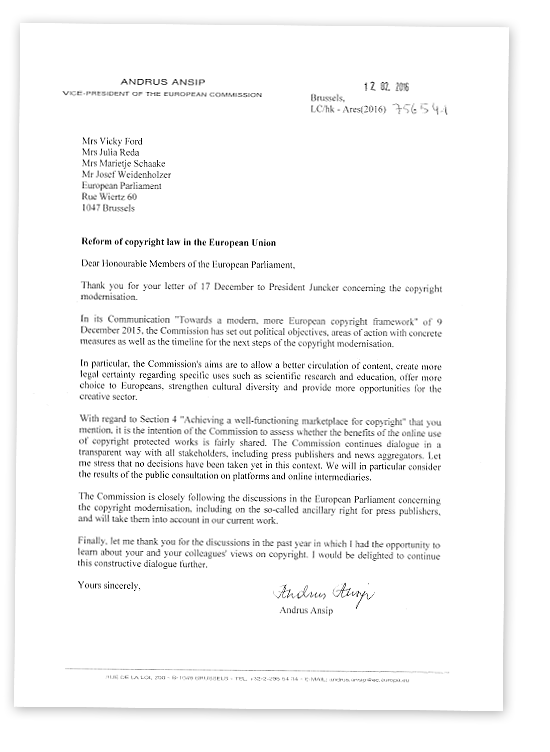 The European Parliament has on many occasions positioned itself against the introduction of such an ancillary copyright. We urge the Commission to remain focused on a reform of copyright rules that strengthens the European Digital Single Market, fosters creativity and research while being aware of the dangers of undermining the foundations of one of the greatest revolutions in Information Technology. Contrary to the suggestions in the Communication, there is no ambiguity in the interpretation of EU copyright rules with regards to content that is both legal in nature and freely accessible on the Internet. Sufficient clarity has been achieved with the judgement of the Court of Justice of the European Union in the Svensson case. While any specific legislative measure will be dealt with by the proper EU institutions in due time, we kindly advise the Commission to take into account the Parliament’s rejection of the notion of ancillary copyright and to clarify the direction of the planned examination. Unfortunately, the platforms consultation was deeply flawed as regards ancillary copyright for press publishers: Only people who first indicated that they were rightsholders were even presented questions specifically related to this topic – all but guaranteeing that the results would be one-sided. I will be holding the Commission accountable to take the full spectrum of voices into account in its policymaking. On the idea of a “snippet fee”, these voices amount to a resounding rejection.